Learn five ways you can improve your promotions! Are Your Promotions Causing More Harm than Good? Promotions can be quite tricky. While most promotions generate engagement and sales, if they lack a clear and concise strategy they can also erode margin and brand loyalty by creating highly price sensitive shoppers. 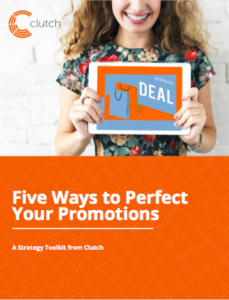 In order to protect your brand from some common pitfalls, we have outlined five steps to create (near) perfect promotions. It All Starts With Data! Incorporating data is the key to any productive promotion stategy. A smart promotion will take into account the intended audience and expected business outcome. But incorporating data is just the start – read on to learn about how to develop a smart strategy that generates long term value for your brand. Learn five ways to improve your promotions!